I'm very surprised that in France students do not have to perform class duty. My MIL told me that during her time, she had to go collect woods for the school. But Hubby and FIL had never involved in anything like this during their school life. My MIL explained that ever since the 1968 student demonstration, French education system has evolved in a way that students are protected against labor type of works. Their only duty is to study. And, no extra curriculum activities. Personally I think class duty is necessary to help build the sense of responsibility, teamwork and sense of belonging to the class. 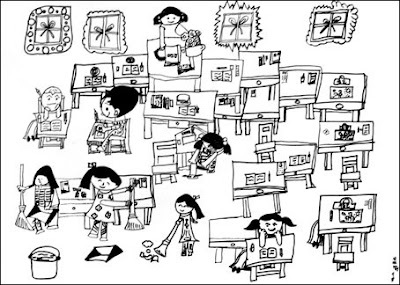 During my time, class duty started as ever as standard 1 (primary school). 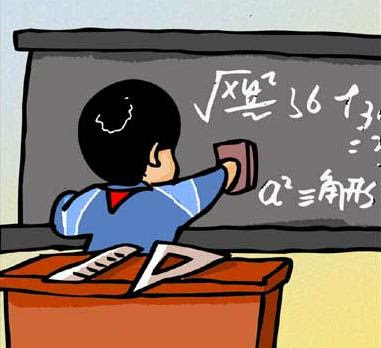 Usually, every student has to perform the duty once a week, either before class started or during the recess time. During the duty, two students sweep the floor, two students align the desks and chairs, one wipe the windows, one clean the white board and empty and dustbin. A class committee would be nominated to handle the cleaning schedule and make sure everyone does their job. 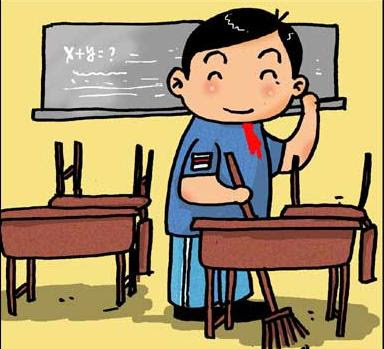 A prefect would be given the responsibility to grade the cleanliness of the class everyday. Every class competes for the Cleanliness Award which is given out once a month and class who won would hung the Award (a flame with a certificate) in the classroom. I had been a class committee. For a very long time we never won the Award. I didn't understand it as it was a boy school and only form 6 classes had girl students and usually girls clean better than guys. So, I led a group of students to decorate the classroom with Chinese NY red envelope and the Malay ketupat wrapping plus made sure everyone cleans well everyday. Eventually, we got the Award, but it was immediately broken by our class monitor while trying to hung it on the wall. Well, at least it was something to be nostalgic about. As of me, in primary school we had turns to sweep the floor, and also in middle school (but that was in an old-school catholic institution). Well we had to do it, but no special praise if it had been done right. Maybe just some detention if someone made a really bad work of it.